The Saviors Archives - Horror News Network - The Horror News You Need! My how things have changed. My last review of The Walking Dead comic (issue 127) was very climactic, but at the same time left readers wondering what was next. The “All Out War” drew to a close, as Rick led the combined forces of the ASF, Hilltop and Kingdom to victory over Negan and the Saviors. 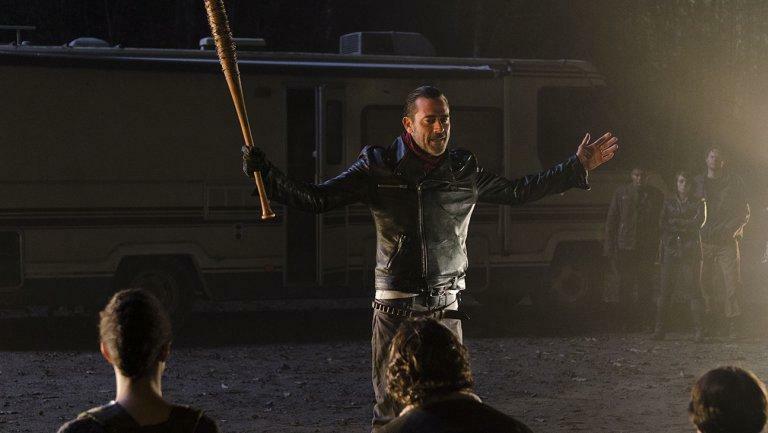 Negan, the greatest villain that Robert Kirkman and friends have created in the history of the TWD saga, was shown mercy and spared, as Dwight led the Saviors in retreat away from the good guys. Evil vanquished, and good rewarded. And oh yeah…..the undead are still patrolling the globe but let’s not get too technical here. Where do we go from here? How about two years in the future, for starters. 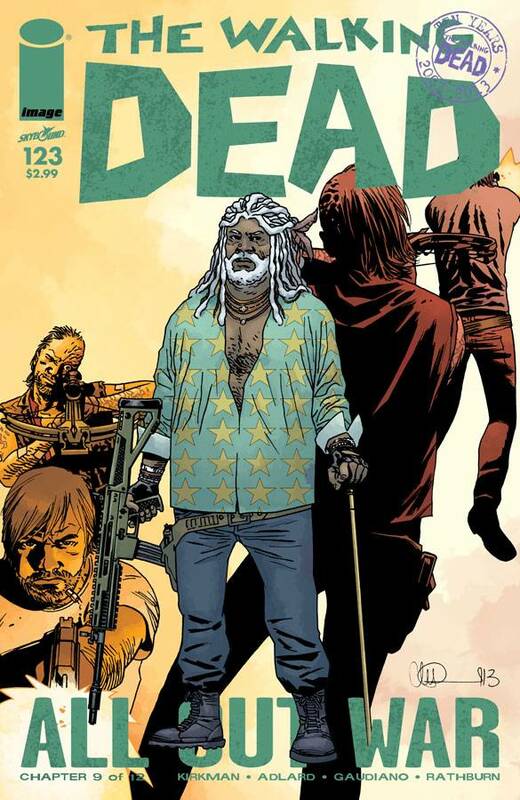 Starting with issue 127, Carl is suddenly 15 years old, Rick looks older and all-too-Herschel-like, and Andrea is being called “mom” on the regular. What a long, strange trip we’ve missed…. Issue 129 picks up with the group of newcomers, who’ve graced the covers of the last three issues despite being complete unknowns, continuing to be suspicious of the group that we’ve spent the last 10 years (in real time) getting to know. Kirkman is doing an admirable job of forcing us to see this world through a new, naive set of eyes. It’s only when Magda’s group arrives and begins questioning this community that the reader takes a step back, looks over the illusory landscape, and with a fresh set of eyes realizes that things seriously do seem to be more than they appear. Oh, and there’s a bearded guy being held captive in the basement of a house. Of course….Magda’s group doesn’t now about him yet but more on that later. Everything appears to be running smoothly. The communities are thriving, there’s a trade route patrolled by citizens that keep the undead and undesirable alike off the trail. All is well….but how much fun can that be? As we know, these are the times when chaos arrives to disrupt the admirable attempt at normalcy. Magda and her friends wander about the Alexandria Safe Zone, investigating every nook and cranny for possible hidden secrets as they still believe nobody (or collection of people) can be this nice and accommodating. The TV show is going through this scenario right now with the whole mess at Terminus (their instincts turned out to be correct). Rick has left to bring Carl to the Hilltop (still being ruled by Maggie), and the outsiders stumble upon the “prisoner” in the basement. Who is it? Why, it’s that lovable Negan fella, of course. Crying and begging to set him free, the newcomers now face a turning point in the series and it should be no wonder as to what they’ll choose to do. After all, when the cat’s away the mice (especially one big rat) will play. Following two consecutive issues of little action and much catching up (and character re-development), it was good to see Kirkman get back on the right track in issue 129. Carl is growing up, and is now dealing with the normal feelings of teenage love, identity confusion and goals for the future all at once. Luckily, he’s still a pretty good shot as well, as he’s able to help get he and Rick out of a potentially fatal situation with some roaming zombies. As for Rick….since the end to the war there’s been a big change in him as well. He verbally and physically berates a road sentry that is caught out of position, causing he and his son to fend for themselves. The emotion and rage shown in his face as he’s beating this man down like a dog in front of Carl is clearly something that he’s never done before. It may be that the pressure of having to protect his family and all communities is wearing on him (again), but since the war is over this doesn’t seem to be the case. More than likely, the all-encompassing power, along with not having to worry about invading armies presently, may be going a bit to his head. It’s certainly something to keep an eye on as we move forward. Well…..”All Out War” has concluded. And there is certainly a winner and a loser. 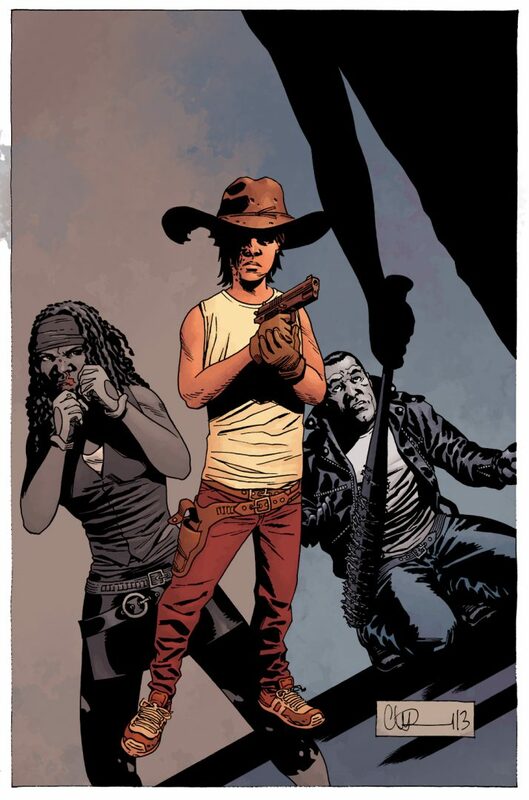 So if nothing else, you can say that about The Walking Dead issue 126. After two years or so of this constant threat of annihilation at the hands of Negan and the Saviors, Rick and his allied forces (Alexandria Safe Zone, the Hilltop and the Kingdom) now know exactly what their immediate futures hold. Since this was such an anticipated issue, with so much riding on the end of this successful storyline, I will refrain from major spoilers in this review as to not discourage fans from reading it (until you see the big “SPOILERS! !” tag, that is). However, I will be sure to reference, using vague and ambiguous allusions whenever possible, the instantly-polarizing events that have caused quite the stir. Sure, we’ve seen this type of love-it-or-hate-it reaction from the fanbase before (the prison and the Governor, the Hunters, etc. 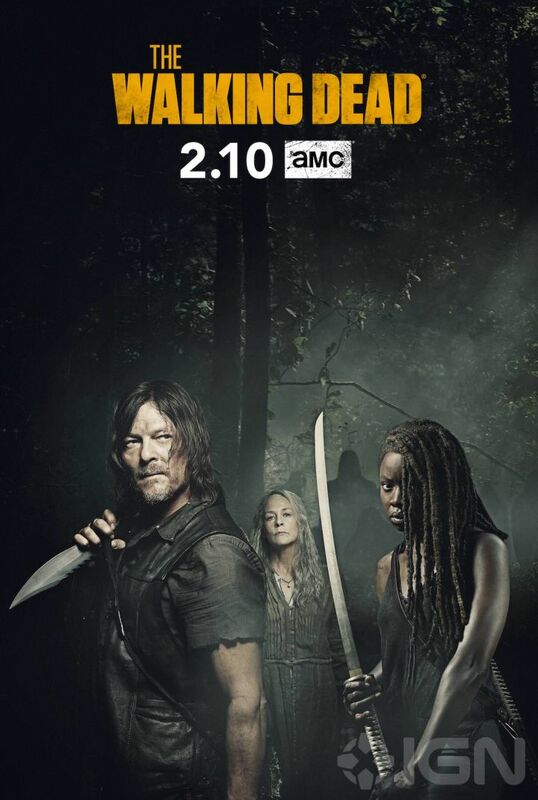 ), but after 10+ years of Kirkman and company bringing us to the edge of insanity (and talking us off the ledge as well), this “new beginning” that was promised may in fact have just begun.